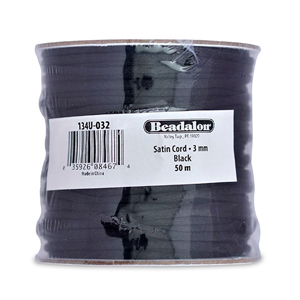 Satin Cord is made of shiny rayon, has a silky texture, and is great for jewelry, craft and any other applications requiring a strong yet flexible cord. Satin Cord can be secured using cord ends (p. 131) or with an adjustable knot. 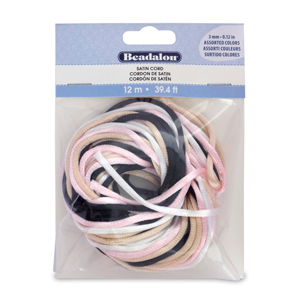 This bead cording is also known as rat tail. Excellent for use with Kumihimo Braiding Disc. Available in Black or in a 4-pack of assorted colors. Made in the USA by Beadalon.